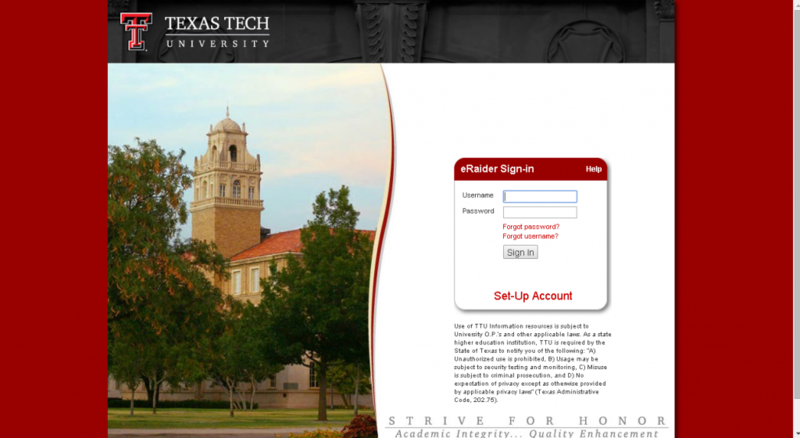 Texas Tech University students can benefit from a TTU Blackboard that allows them to attend courses online. The Blackboard TTU developed was designed to promote distance education for students who cannot reach classes that take place at TTU. The TTU Blackboard program offers all of the necessary learning tools students need in order to undergo a full education program from a distance. By accessing Blackboard.TTU.edu, students can benefit from educational content, receive, complete and send assignments and take tests to progress. 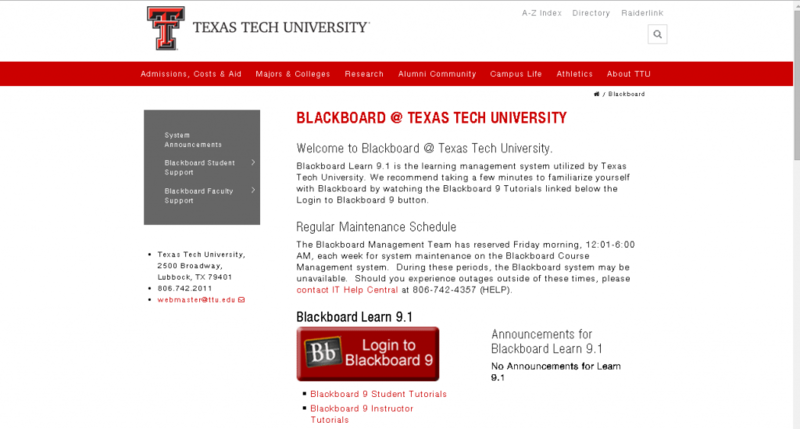 Let’s see how a student can access blackboard TTU login platform. When taking tests in Blackboard, students are encouraged to save their answers as they go through tests, avoid clicking back, forward or refresh and to use a network cable for safe and undisrupted connection. Students are recommended to close any other open tabs in their browser before starting to work on Blackboard for easy usability. The Blackboard Student Support page offers a list of all browsers that can support the Blackboard Learn 9.1 system. New TTU.edu students might not be familiar with this kind of program, so we have created a walkthrough for detailed assistance. Discover how you can access the Blackboard TTU login platform below. In order to login to the TTU Blackboard, you will have to possess an eRaider username and password that you received after setting up your account with the university. Open your internet browser and type in TTU.edu. You will be redirected to the http://www.depts.ttu.edu/lms/ web page where you can begin the first step of the Blackboard TTU login process. On the lower half of the page, you will see a large red button that says “Login to Blackboard 9”. By clicking this button, you will be sent to the eRaider Blackboard TTU page where you can continue the TTU.edu Blackboard login process. Alternatively, you can go to this link for quicker access: https://eraider.ttu.edu/signin.asp?redirect=https%3A%2F%2Fwebapps.itsd.ttu.edu%2Fshim%2Fbblearn9%2Findex.php. To be able to proceed, you will need to enter your eRaider login information. Enter your designated student username and password and then click “Sign In” so you can subsequently access Blackboard.TTU.ed. If you cannot remember your password, you can reset it at this link: https://eraider.ttu.edu/acctrecover/pages/index.aspx?process=password. You will need to provide your eRaider Username and your date of birth. Additionally, you must have access to your alternate contact method that you gave when you established your first password. The complete password reset process involves: user information, user ID check, choosing alternate contact, entering verification code, entering your new password and completing the password reset. If you cannot remember your username for eRaider Blackboard TTU access, you have to provide a few pieces of personal information for identification here: https://eraider.ttu.edu/acctrecover/pages/index.aspx?process=username. Type in your legal first and last name, as well as your date of birth so you will be able to continue with Blackboard TTU login. For Blackboard TTU login to work, you have to enter your first name, last name, birthdate and code. Confirm by pressing the designated button below. In the end, you will need to activate your account to continue the Blackboard.TTU.ed u login process. After your account is all set up, you can go back to Blackboard.TTU.edu and enter your username and password to continue. Established in 1923, Texas Tech University encourages current and potential students that “From here, it’s possible”. It is a state university with approximately 35,000 students (roughly 28,600 undergraduates, 5,800 postgraduates and 2,200 Doctoral students) and over 2,500 Academic staff. It is located in Lubbock, Texas and has an 1,839 acre campus in this urban area. It is home to the Red Raiders and is defined by a scarlet and black color combination. In 2015, Texas Tech University was recognized as one of the greatest colleges to work for by the Chronicle of Higher Education for the second year in a row. The Texas Tech University has a total of ten colleges in different fields of activity: Agricultural Sciences and Natural Resources, Architecture, Arts and Sciences, Rawls College of Business Administration, Education, Whitacre College of Engineering, Honors, Human Sciences, Media & Communication and Visual and Performing Arts. Aside from these, they also have a Worldwide eLearning program available for students across the globe. More than 80 majors are available for undergraduate students, which range from Advertising to Zoology. They also offer two graduate and professional schools: Graduate School and School of Law. The average student budgets for the Academic year of 2015-2016 add up to $24,870 for undergraduate students, $24,262 for graduate students and $39,321 for law students. These budgets include tuition and fees, room and board, books and supplies, transportation and other personal costs. Financial aid is available for eligible students, under the form of grants or loans. Scholarships and grants are completely free for students with achievements in certain areas. A few grants available for Texas Tech University students are the Federal Pell Grant, the Top Ten Percent Scholarship or the Federal Supplemental Education Opportunity Grant (SEOG), among others. Loans must be repaid with interest; a few options are the Federal Direct Subsidized Stafford Loan, the Federal Graduate PLUS loan or the College Access Loan. The Texas Tech Alumni Association has more than 27,000 members, with names such as astronaut Rick Husband (Congressional Space Medal of Honor, Space Shuttle Columbia final commander), Demetrio B. Lakas (1969-1978 Republic of Panama President), governors Daniel I.J. Thornton, Preston Smith and John Burroughs, as well as reputed artists and athletes. Many students that began with the Texas Tech University Red Raiders team continued their careers in the NBA or NFL, such as Zach Thomas (Kansas City Chiefs), Michael Crabtree (San Francisco 49ers) or Wes Welker (Denver Broncos). Any students interested in attending the Texas Tech University can contact their offices by calling 806-742-2011 or emailing webmaster@tech.edu.